FCA is committed to building up, training, and sending out coaches and athletes to minister for Christ. Without doubt, coaches are some of the most influential people today. Hundreds of thousands of young athletes will be impacted for Christ as we encourage, equip, and empower their coaches. The newest resource officially promoted by FCA is the book, “Best Season Yet: 12 Weeks to Train,” in both coach’s and athlete’s editions. The author, Rebekah Trittipoe, writes authentically as a life-long athlete, adventurer, and coach. Best Season Yet: 12 Weeks to Train is a 12-week guide geared towards coaches and their team, guiding them to embrace their talents and discover a purpose aside from winning and losing. Themes in the book include: commitment, submission, goal setting, pain and suffering, and pursuing excellence. The study provides opportunities to discuss and journal ways to apply the lessons learned to their lives. Each chapter has supplemental material, instructions for a team activity that aligns with the week’s theme, and suggestions on how to close the meeting. The book is formatted into five easy-to-read stories that make it easy to complete in a Monday-through-Friday school setting. FCA Vice President of Field Ministry, Jimmy Page says, “Find a game plan to keep the “main thing the main thing.” This book is about more than great performance; it’s about encouraging others to be great people- fulfilling their God-given purpose for life! “ “Best Season Yet” is available to order from Amazon, DeeperShopping.com, Barnes & Noble, and ChristianBooks.com. For more complete information about these books, click here. Run the straights. Appreciate the curves. After a day of travel with a bunch of teenaged tracksters on a crowded mini-bus, I now savor some alone-time in my hotel room. I love these kids and their enthusiasm (albeit unbridled at times). Nonetheless, when the rooming gods assigned me a suite sans children, I must admit to the extreme effort it took to suppress the happy dance hidden away in my soul. Time to write. Time to reflect. Time to breath deeply and with great content. As the air conditioner rhythmically grinds away in the corner with an unusual rattle, it silences outside distraction. The television is off and email and Facebook have been X-ed out. What remains are the thoughts making their own strange rattles in my heart and soul. I enjoy these kids. I embrace being their coach. I savor the relationship I have with them, being able to convey lessons I've learned along the way. I am passionate about helping them understand who they are as children of the King. And I yearn for them to realize God's intention and purpose for making them athletes, among other things. They, you, I, have been prepared for such a time as this. As I daily watch these kids take to the track, I can't help but notice the straights and curves. The 200-meter indoor track has short straights and tight curves. 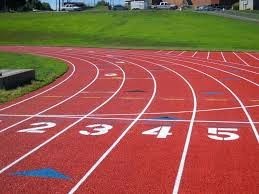 The 400-meter outdoor track sports longer straights and more gentle curves. But in either case, the curve is where the action is. The curve is what makes makes the race interesting. 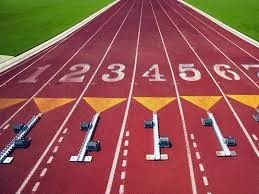 Imagine a 1600 or 3200 meter run conducted on an arrow-straight course. That would be about as enticing as walking barefoot across burning coals. I've lived my share of straights and curves. Some of the straights have been, well, pea-picking boring. But after spending some time on a tortuously curvy course, the straights have also meant a time to relax and get back in the groove of precious routine. The thing is, its impossible to appreciate the straights without some curves. At the moment, I'm running a curve--and loving every minute of it. With the wind in my hair and the track disappearing under my feet, I can't wait to see what is around the next turn. I am leaving the known to run to the unknown. 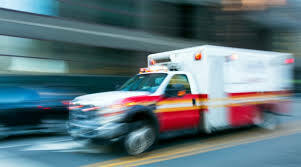 After teaching school and coaching, being a cardiovascular perfusionist for 25 years, consulting, teaching again and coaching, I've hit another curve. However, I’m convinced that God has orchestrated events and equipped me with the skills, passions, and abilities to fill a new role. I'm grateful when I look back. It's like climbing a densely wooded mountain trail. You know the winding path is right, but do not fully appreciate your position until you break onto the open ridge, now able to see from where you've come and what lays ahead. God has called me to full-time ministry with the Central Virginia Fellowship of Christian Athletes (FCA). I am slated to be FCA’s area representative. My goal is to officially begin on July 1, fully funded, although I am scheduled to coach and speak at summer FCA sports camps prior to that date. Being funded will allow me to approach the fall seasons without distraction, concentrating on ministry instead. FCA is the largest sports ministry in the world. Since 1954, FCA has challenged athletes and coaches to impact the world for Jesus Christ. FCA annually reaches about two million people on every level—professional, college, high school, junior high and youth. FCA staff is 800 strong in over 400 local offices across the country. Our efforts are focused on the“4 C’s” of ministry: Coaches, Campus, Camp, and Community. You can read more about this approach on FCA's website. The task of impacting athletes and coaches in Central Virginia is too large for me alone. 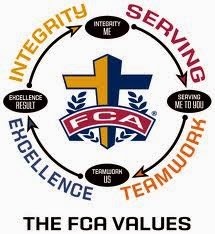 FCA is structured such that I raise support to cover the practical costs for my own training, training coaches and volunteers, books, Bibles, team materials, funding to enable students to attend camps, campus activities, team meals, hospitality for coaches, travel expenses, national administrative costs, and much, much more. Though salary and insurance cost must also be raised, more than half of the budgeted monthly need ($7,300) is used directly in ministry. I say this to be transparent and assure you that your support will be wisely used to advance the Kingdom of Christ. Therefore, I’m seeking faithful teammates to consistently invest, enabling this FCA ministry to go forward. Your prayers and financial support (which is tax deductible) provide the foundation for my service. Though your response at any time is welcome, hearing from you by the end of May will be such an encouragement! If you prefer electronic giving, please visit https://my.fca.org/4893-trittipoe-rebekah.aspx to set up automatic payments. I pray Christ’s richest blessing be upon you, your family, and your work as you seek and follow Him!